The weather in Minnesota was unusually amazing this week for March! We had day after day record high temperatures. I have to say we were thrilled with this very mild and short winter! We are so glad spring is a few days away. A few years ago in February we attended a cave wine and cheese party at Pine Ridge Vineyard with our friends Joe and Lisa. If my memory serves me, it may have been for a Fortis release party. During the festivities we heard that Pine Ridge was no longer going to bottle the Andrus Reserve and would be focusing their efforts on Fortis. 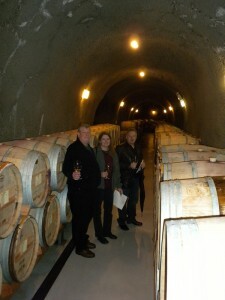 Bill, Joe, and Lisa entering the cave. We were sad to hear the wine was no longer being bottled as it was amazing and also Chris’ pick of the tasting… so we immediately talked to Christine (part of the wine club team) about getting our hands on some for the cellar. 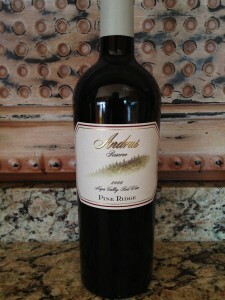 Both Joe and I purchased a case of the 2006 Andrus Reserve. The Andrus Reserve is a Red Bordeaux blend. As you probably know Bordeaux blends are my favorite. Bordeaux, France is on my wine bucket list (another blog) and I am confident there will be a trip in 2013. Chris and I plan on visiting with our dear friends Pierre and Monique (Chateau Lassugue) while we are there… it’s our dream! I truly enjoy wandering down to my cellar. I feel very blessed to have many friends who enjoy wine, as well as the many friends we have met in the Valley’s. I feel like every bottle has it’s story. This one is a good one and I have many more unique stories yet to tell. I had an inclination earlier Friday that I was going to enjoy an Andrus. I even tweeted about it before I grabbed the bottle and pulled the cork. 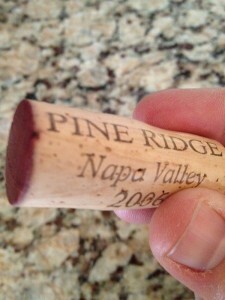 The cork was looking really good and showing age gracefully. I attempted to squeeze it and it was still very hard. I am confident that our other Andrus bottles will cellar for fifteen years or more. It was time to pour some wine. Viewing the wine it had a nice deep purple color to it. The edge of the wine had a light hue, so the bottle was aging well. It was time to smell it. I immediately noticed dark ripe fruit, dark cherry and blackberry. Time for a sip; as soon as I sipped the wine, the soft tannins attacked the front of my tongue and trough my mid palate. Chris was just humming as she enjoyed her first sip…. As you exhaled, you could pick up a hint of caramel. This wine has a great soft finish to it! As we moved to our second glass the profile of the wine slightly changed. 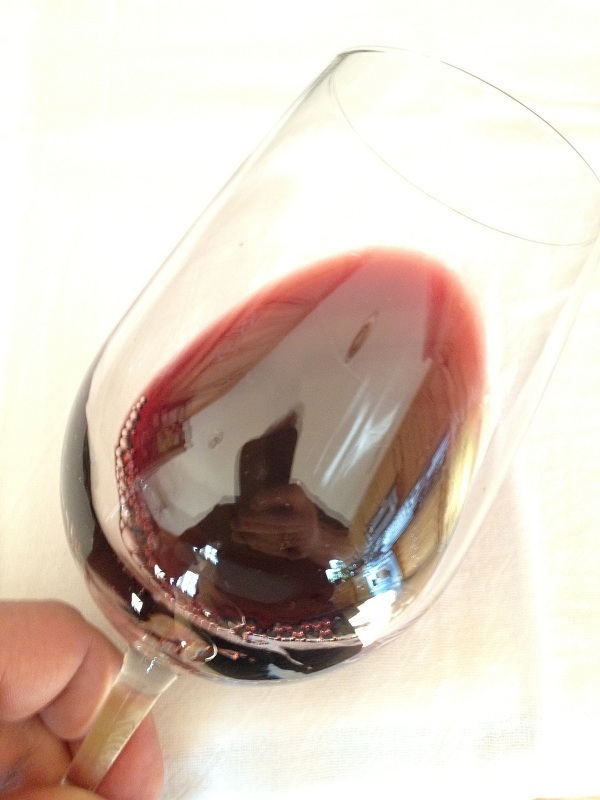 As we sipped the wine we noticed the finish was more prevalent to the back of the tongue. It truly is an enjoyable wine. I would recommend wandering down to the local bottle shop or search online for this wine. It would perfect for a special occasion. Or if you are like me, every Friday is special!